The body of a missing Centers for Disease Control researcher has been found. Timothy Cunningham, 25, was last seen on February 12. Cunningham headed up a research team with the Center For Disease Control’s Division of Population Health. Cunningham had made claims, shortly before his disappearance, that a “catastrophic” flu shot was the cause of this year’s deadly flu epidemic that reportedly killed thousands. Cunningham reportedly mentioned: “if something happened to him” that he wished his name to be made public. Cunningham was a Harvard-trained epidemiologist and US Navy officer. His body was recovered in the Chattahoochee River in NW Atlanta on April 3, over fifty days since he was reported missing. Snopes.com, a fact-checking website that pretends to uncover fake news, says the original news source linking Cunningham’s death with his alleged claims about this year’s deadly flu shot, was made by a bogus website, Yournewswire.com. Yournewswire.com interviewed doctors who also claimed flu shots led to patient deaths. Dr. Daniel Neides, Chief Operating Officer of the Cleveland Clinic Wellness Institute, was fired after airing his experience with flu vaccines and the illegitimacy of the CDCs advice on flu vaccination. Dr. Neides himself suffered serious illness after he had a flu shot. His personal report was published at Cleveland.com. Yournewswire.com linked to Dr. Neides report. Dr. Neides’ was required to get a flu shot to keep his job. He fell ill for two days following his vaccination. 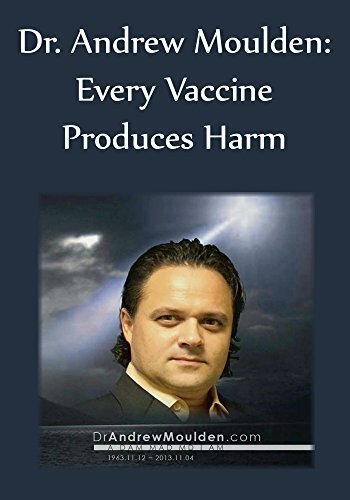 He explains four other workers at his job site also underwent flu shots on the same day he did and also became ill. (Click on video) Vaccines on Trial: Tru... Pierre St. Clair Check Amazon for Pricing. Neonette.com, a self proclaimed “free independent news source created by people for people, not corporations,” posted a report on January 20, 2018, stating “a CDC doctor claimed that this year’s ‘catastrophic’ flu shot is likely to be responsible for the outbreak of the deadly flu epidemic currently sweeping the country.” The Neonette report said their report was attributed to “one doctor who has chosen to remain anonymous.” The Neonetter.com report was aired two weeks prior to when Dr. Cunningham was reported missing. On January 8, 2018 the Santa Barbara Independent reported that eight Santa Barbara County residents over age 65, all but one who had been newly vaccinated and also had received flu medications from urgent care centers, died of the flu. That compared to three flu-related deaths in the prior year. The H3N2 flu strain, reported to be resistant to vaccination, was cited as the primary viral component in these deaths. By January 12 the Los Angeles Daily News reported there were 36 flu-related deaths this season in California for adults under age 65 compared to 13 for the same time last year. No data was given as to whether these subjects had been newly vaccinated. On February 22, 2018 The Center for Infectious Disease Research and Policy (CIDRAP) at the University of Minnesota released a bulletin that claimed the World Health Organization had suddenly issued an advisory to recommend changing two of four components of quadrivalent vaccines (protects from four different strains of the flu) offered this flu season. The CIDRAP bulletin said there was a mid-season switch, probably emanating from a mutation in the H3N2 flu virus, that resulted in “problems with poor vaccine effectiveness.” The CIDRAP bulletin appears to confirm the vaccine had the mutation, it didn’t just happen in the population at large. The microbiologist called for a comparison of egg-based versus cell-based vaccines. This statement suggests there is a supply of flu vaccines in stock or being prepared for next flu season that will have the same deadly genetic mutation. 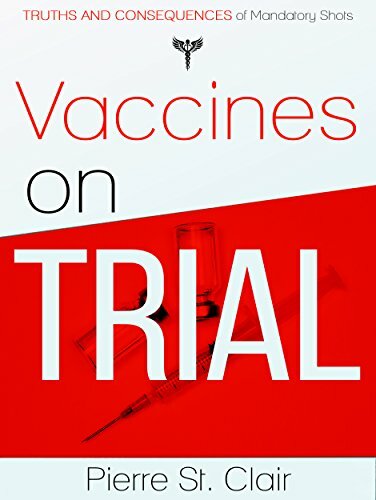 On March 1, 2018 Medscape reported FDA Commissioner Scott Gottlieb had issued a news release saying he believed the “influenza A (H3N2) virus strain selected for this season’s vaccine was appropriate and that experts are working to determine why the vaccine was less effective than expected.” That H3N2 vaccine was reported to be 25% effective. While there was no admission it may have induced deaths among unwary individuals, Gottlieb’s news release does concede there was an effectiveness problem with the flu vaccine used in early 2018. Dr. Andrew Moulden: Ev... John P. Thomas Check Amazon for Pricing. A March 9 CNN news report confirms that 80% of hospitalization due to the flu were attributed to the H3N2 flu strain. Virtually all public health authorities continued to recommend flu vaccination throughout the early 2018 season despite the mid-season realization the flu shot wasn’t working. The news media couched their words, burying the fact this year’s vaccine was not only less effective, but that it contained a mutated flu strain. The one health authority who didn’t couch his words ended up dead in the Chattahoochee river. NationalGeographic.com report says a “reason this year’s flu has been so bad is complications with the vaccine. Most influenza vaccines are grown in chicken eggs, and when this year’s vaccine was being incubated, the virus mutated while it was growing and became less effective.” The flu vaccine was reported to be ~30% effective versus ~60% in other years. The CDC report notes the effectiveness for this year’s flu vaccine when broken down into viral subtypes shows the vaccine was 25% effective against Type A (H3N2) and 67% effective against Type A (H1N1). Among children age 6 months to 8 years flu vaccine was 51% effective. The CDC says 151-166 million doses of injectable vaccine were prepared for the 2017-2018 flu season. Public health authorities knew early on that the flu vaccine for this season was problematic but continued to urge the public to vaccinate. Out of a population of 325 million Americans, less than half are vaccinated and yet no flu pandemic results. This is nebulously explained away by “herd immunity.” A noted pediatric specialist says vaccines actually destroy herd immunity. An alarming question is raised in the CDC report. The CDC interim report noted that flu vaccination for children age 9-17 years for 2017-2018 “is listed as -8% effective.” The report than asks: “What does that mean? 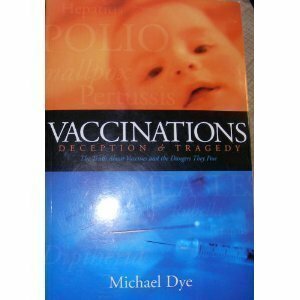 Did vaccination increase the risk of getting flu?” (Page 7). The CDC explains this away by saying the confidence interval (-62% to +29%) was too wide to conclude the vaccine was more troublesome than it was protective. Yet CDC officials continued to repeat their mantra for children to be vaccinated. In a scare tactic, the CDC continues to issue data to the nation’s mindless news press that the flu kills ~36,000 Americans on average annually. The 2017-2018 CDC interim flu report stated flu-related deaths in the US ranged from a low of 12,000 (2011-12) to a high of 56,000 (2012-2013). But flu deaths are combined with deaths from pneumonia, as can be seen in the following chart. It is impossible to estimate the number of flu-related deaths. Most deaths are obviously caused by pneumonia among elderly Americans. 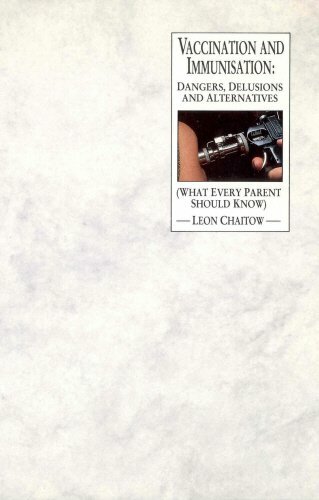 An incongruent figure that is repeatedly distributed by the CDC is parroted by the news media. The CDC issued a report that there were 28,543 laboratory-confirmed flu-associated hospitalizations between October 1, 2017 and March 31, 2018. Presume 10-25% of these hospitalized patients died which would be an unusually high estimate. That would come to only ~2500-7000 deaths, far lower than health authorities report. The higher figures appear to be used to frighten the public into vaccination. 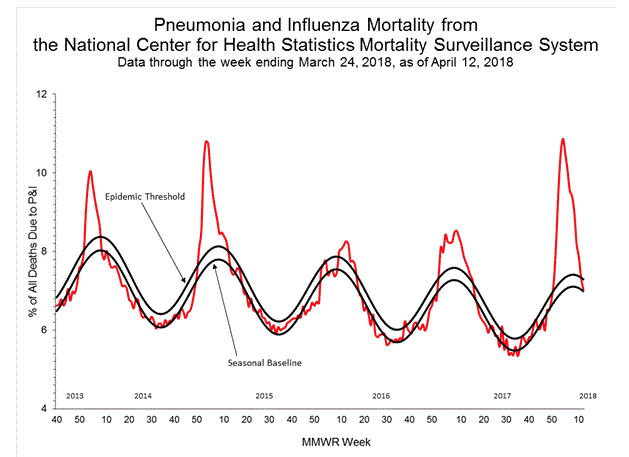 While the CDC and news agencies report flu-related deaths in 2017-2018 rose 37% over the prior year, that is a relative number. 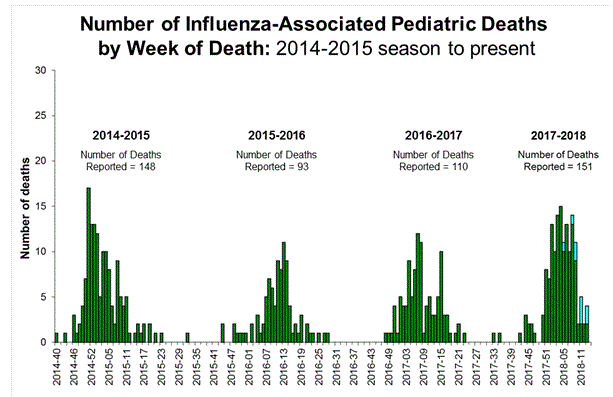 In hard numbers, the number of flu-associated pediatric deaths rose by 41 (from 110 to 151). This statistical jump could be completely explained by the lack of effectiveness of this year’s flu vaccine. A jump of just 50 flu-related childhood deaths is considered an epidemic by public health authorities. Vaccinating 36-48 million American children to prevent ~150 deaths seems to be an overkill. At $25 per flu shot it is costing America $6000-8000 to prevent one flu-related death in children. Epilogue: In the wake of the unexplained murder of Seth Rich and the retrieval of body of CDC researcher Timothy Cunningham from the Chattahoochee River, this reporter makes readers aware of the risk investigative journalists take in reporting news like this nowadays. Americans need to stop seeing what is going on in America through the lens of their political affiliation and take back control of their country, at the very least, for the sake of their children. Previous article by Bill Sardi: First Genetically Modified Humans?